View of Roughty Bridge in Kenmare, County Kerry, Ireland. The Roughty River rises in Kilgarvan and runs in a westerly direction to Kenmare Bay. 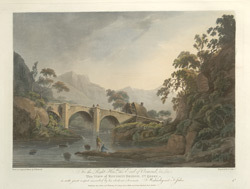 The bridge over the river depicted in this aquatint is a two span, stone bridge and is well known in the area.